How To Setup a Professional Email Address With G Suite? To look like a professional it’s important to have a professional email address. Most of the people create an email address using their own domain name. But the web hosting companies use the unsecured path to send and receive the emails. You can’t have the surety of the positive results. You won’t know whether the message would deliver or not. To get rid of this problem, you should setup a professional email address with G Suite ( Google Apps For Work). Google has rebranded by changing its name from Google Apps for Work to G Suite. Though it’s a paid service but you can also enjoy a 30-day free trial. What Are The Benefits of Using G Suite? As I have mentioned above, web hosting companies are not reliable in this matter. They use the PHP function for their email services. Sometimes, your important emails can get missed. A professional doesn’t take such risks. Whereas Google has the best email network which doesn’t let anyone down. It gives you many features. And if you want to test G Suite then setup your free account. What Should You Do To Create A Custom Email Address? We have already talked about creating a business email address with the use of your own domain. If you don’t have your own domain name then you can buy it from G Suite. Let me start the process. 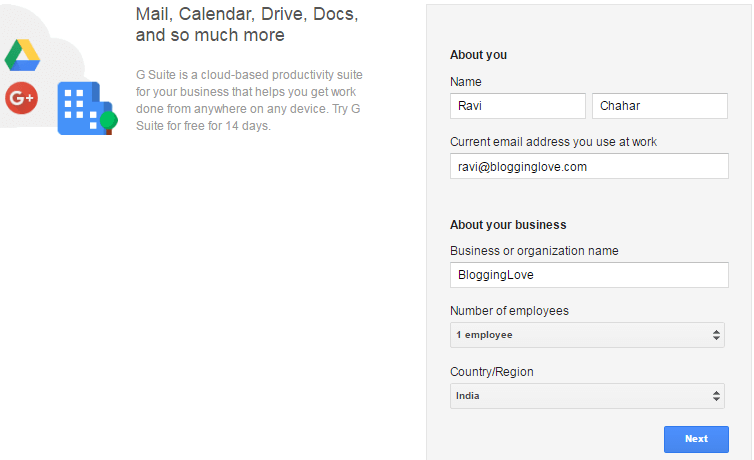 Step 1:- Visit the official website of G Suite and click on the “Start Free Trial” button. Step 2:- You will be asked to fill the information about you. Your name, company name, your current email address and all. Fill the information and click on the “Next” button. Step 3:- G Suite will ask you whether you want to use your own domain name or you want to buy a new one. If you’re having a self-hosted blog with WordPress then use your domain name. And if you want to buy a new one then you have to pay for it. Google charges 8$/year. Step 4:- You would be asked to enter the username for your G Suite account and an alternate email address you want to use. You have to generate the password so that you can use these login details to login to G Suite admin panel later. Clik on the “Next” button. Step 5:- Now is the time to set up your G Suite account. You will see an option to start adding more people in your team. Click on the “Start” button and add any other user if you want. If you want only you then check the box shown. Step 6:- As you have used your own domain name so it’s important to verify that domain name. There are two different ways. Google will automatically detect the web hosting you use. 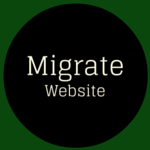 For example, BlueHost, Inmotionhosting, WP Engine. If you don’t see the name of your web host then you can search for it. 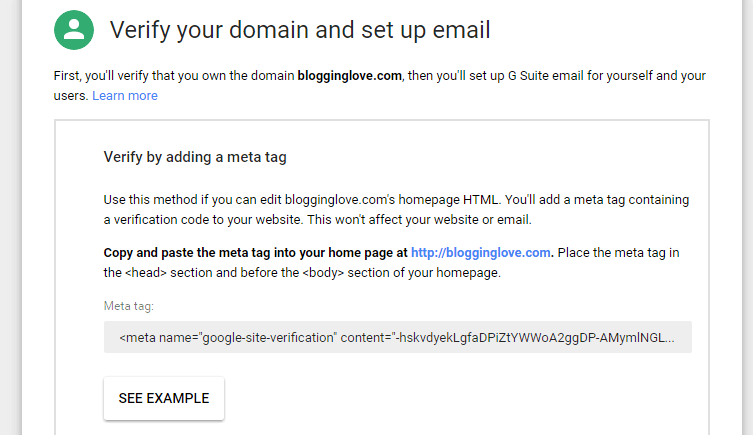 Whether you add the “meta” tag in the head of your website or you can download the HTML file and upload it in the WordPress directory. Step 7:- You’re going to change your email service from the default web hosting feature to the G Suite. So you have to change the records from your web hosting cPanel. Step 8:- Choose your domain name and a new page will appear to you. Scroll down and you will see the already existing MX Records for your domain name. There may be one or many existing records. Delete them. 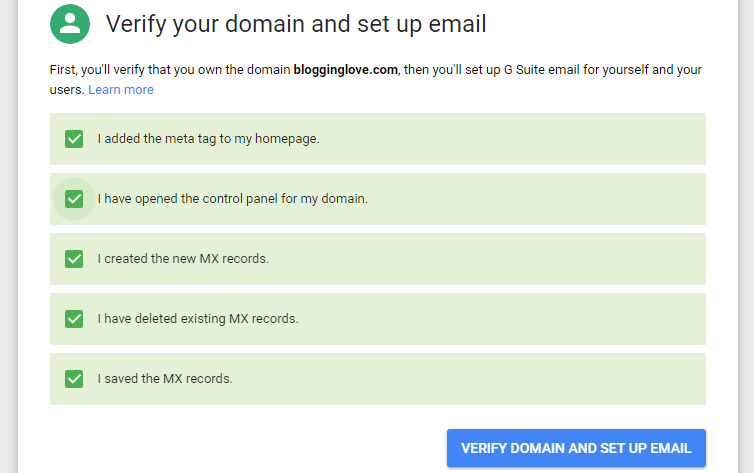 Step 9:- Under “I created the new MX Records”, you will see the records provided by Google. You have to add those records to your cPanel. Pick up the detail of each record and add on the same page where you have deleted MX records. Step 10:- Check all the checkboxes after adding the “meta” tag or the file in your website, deleting and adding the records in the cPanel. After checking all the boxes, you have to click on the “VERIFY DOMAIN AND SET UP EMAIL” button. The verification may take time because Google will look for the file and the records you have added. It will show the estimated time. It may be one hour or more. After verification, you will see the notification that your domain name has been verified. Congrats, your task to setup a professional email address with G Suite has been accomplished. You can use it like you use other email addresses. You can visit Google admin console to login or just like your Gmail email address, you can use your custom email address too. Just enter your email like “andy@domain.com” with the password and here you go. Can You Now Properly Setup A Professional Email Address With G Suite? Many people get confused just because of this long process. But in reality, you just have to follow the steps. After filling the details, you just have to wait for the verification. The only problem occurs with the domain verification. Adding the “meta” tag may seem odd to many users. 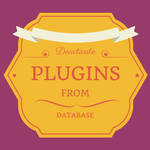 So it would be great to download and upload the HTML file in your website directory. Choose your domain name carefully. Being a professional, you should create an email address which can relate to your company. People judge too quickly and you want to put some positive impression. After going through the above-mentioned steps, you won’t ask how to setup a professional email address with G Suite again. Just try the free version and if you feel like spending some money then go for pro. If you have any doubt, feel free to contact us. How To Transfer WordPress Site From Localhost To Server? I’d only heard about G – Suite but didn’t know all the details, as you mentioned them so well here. We do use the one from our blog, so the domain name is there and somehow Vinay has set that up (in fact) a number of emails in Gmail itself – I guess that works well for us presently, but this surely can be tapped if need be. Even I didn’t know that G Suite provides such services. I was going through an article about email marketing then came across this. People crave to get a custom email address and Google is providing some great features here. This is a great how-to article on setting up a email account with Google. I think it is a very professional thing to do to have your on email account with your domain name, instead of someone elses. It gives the impression that you are serious about your business. I think people are more willing to take you serious if you do this. It does require some technical knowledge however, but I think it is worth it in the long run. Thanks Ravi, for this informative tutorial and I will be sure to share it. People are checking out for such small details. And no one wants to seem like unprofessional. Having a custom email address adds the value to your approach. G Suite provides you the feature to have one. Thanks for sharing brother, keep it up! Whenever you enter in a professional field, you take all the necessary steps to look like a professional. Having an email with your domain name increases the trust. G Suite can help you with that. What a great explanation about G-Suite. Even the non-techie person like me can follow along with your “friendly” instructions. I haven’t used it ….yet, but if I do you know I will be contacting you my friend. G Suite is an amazing platform. Sometimes, your web hosting misses the emails which are orphaned to you. But G Suite doesn’t do that. It gives you the service you want. Yeah, sure, I would be happy to help.